We're the place for innovative, delicious and fun treats in your neighborhood! For over 62 years, we've been delighting customers with our irresistible flavors and treats. We still follow the same credos and innovative thinking as our founders, Burton Baskin and Irvine Robbins. With more than 5,800 retail shops in 40 countries, we’re now the world's largest chain of ice cream specialty shops. Nearly three-quarters of a century ago, two brothers-in-law shared a dream to create an innovative ice cream store that would be a neighborhood gathering place for families. Burton "Burt" Baskin and Irvine "Irv" Robbins had a mutual love of old-fashioned ice cream and the desire to provide customers a variety of flavors made with ingredients of the highest quality in a fun, inviting atmosphere. As a teen, Irv worked in his father’s ice cream store. During World War II, Burt was a Lieutenant in the U.S. Navy and produced ice cream for his fellow troops. When the war was over, the two entrepreneurs were eager to capitalize on America’s love of ice cream. They started out in separate ventures at the advice of Irv’s father. In 1945, Irv opened Snowbird Ice Cream in Glendale, California. His store featured 21 flavors and emphasized high-quality ice cream sold in a fun, personalized atmosphere. A year later, Burt opened Burton’s Ice Cream Shop in Pasadena, CA. By 1948, they had six stores between them. This concept eventually grew into Baskin-Robbins. 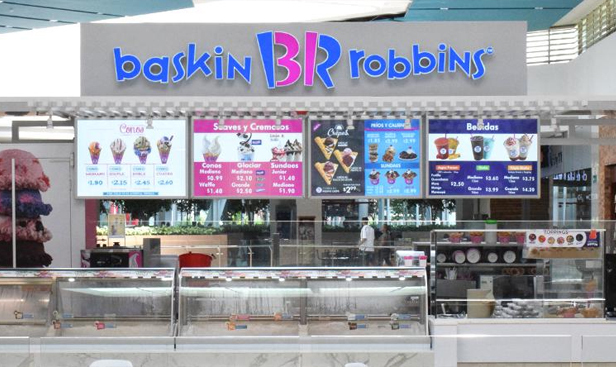 Detail Baskin-Robbins® has over 3,000 store locations in over 40 countries outside the US. You might be surprised where in the world you’ll find us. In Japan alone, we have over 850 locations, which is the highest number of locations outside the US! Following Japan is Korea, the Middle East and Latin America. We’re one of the world’s most recognizable brands of ice cream treats and the world’s largest ice cream specialty chain! In addition to these criteria, all prospective franchisees must meet Baskin-Robbins minimum financial requirements, usually a net worth of $300,000 and liquid assets of $100,000 for a new unit and the requirement could be higher or lower for existing units. etc. Baskin-Robbins franchisees are supported by the power of our vibrant senior leadership-from our visionary CEO, Jon Luther, to the award-winning culinary team who dreams up new fare for customers to enjoy. The dedication of our leaders keeps the stores and the company moving forward on Grand Opening day and every day.